Home Celebrities Chandra Bahadur Dangi – Bio, Height, When and How Did He Die? Through the years, the world has seen people on extreme sides of any spectrum, whether you are looking at height, weight, intelligence or any other thing in between. Looking at height, the tallest man on record is Robert Pershing Wadlow, who stands at 2.72 m (8 feet 11.1 inches) tall while the shortest man on record is Chandra Bahadur Dangi, who stands at a height of 57 cm (1 foot 10 inches) tall. Before his death in 2015, Dangi was the shortest man to have ever been recorded and he also held the record for the shortest man living. Read on to find out more about his height as well as the circumstances surrounding his death. Chandra Bahadur Dangi was born in Salyan, Salyan District, Nepal on 30 November 1939 as the seventh child in a family of eight. He was raised together with his siblings which comprised of more boys than girls. When he was born, Dangi was almost of average birth size and so there were no concerns. However, a few years later, it became obvious to his mother that while all his peers were growing, her little boy was not. To fix the issue, he was administered with bone-strengthening medicine, but that did not change anything as he did not grow any further. Although his family had a problem with height, Dangi seemed to be on the extreme as only four of his other siblings, including his sisters, are of average height, while three of his brothers stood at only four feet tall. There is no record of any medical condition that caused his stunted growth which has been described as a primordial dwarf; a type of dwarfism in which one has a smaller body size than normal at all stages of development since from birth. Before he became famous for his lack of height, Chandra Bahadur Dangi was a craftsman who made placemats and head straps for people to help them in carrying heavy loads on their backs. Apart from that, he also assisted people in taking care of their cows and buffalos. He was also making money weaving mats. Because of the challenges he would have living alone since he was unable to find love, Dangi spent his life with his elder brother and his family who took care of him until his death. As already stated, Chandra Bahadur Dangi had a height of 2.72 m (8 feet 11.1 inches) which places him as the shortest man in recorded history. According to the Guinness World Records, he is as tall as six stacked cans of baked beans. Living with his family in Rimkholi, a village that was isolated and had no electricity, he was first spotted in 2012 by a timber merchant. 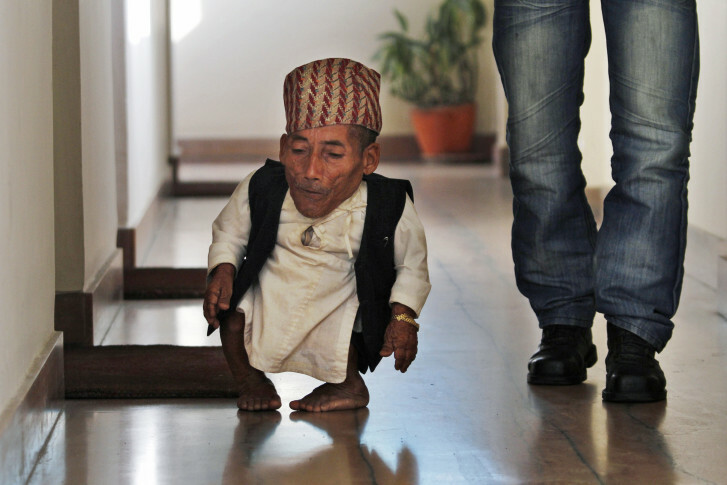 The merchant believed Dangi could break the record for the shortest man in the world, and so he went to Kathmandu, the capital of Nepal, where he was assessed and soon presented with a certificate for being the shortest person alive and the shortest in history. After this, Dangi became popular all over the world and he got the chance to travel to different parts of the world, including London where he met the tallest man living at the time, Sultan Kösen. Before he was found, the shortest individual was Gul Mohammed, an Indian who had a height of 57 cm (1 foot 10 inches). Following Dangi’s death, the baton has been passed to Junrey Balawing, who is from the Philippines. Balawing, who was born in 1993 stands at a height of 59.9 cm (23.6 inches), making him the third shortest man in history. For his body size, it would only be normal for one to assume that he would have health problems, but Chandra Bahadur Dangi claimed that he had always been a man blessed with sound health and so he had never been treated for any serious health issues. Unfortunately, he died on 3 September 2015 in the Islands of American Samoa at the age of 75. Although there was no official cause of death that was given, it was stated that he was suffering from pneumonia. At the time of his death, he was on tour in the South Pacific.